The Miami Trace Youth Football Program’s seven teams began the 2017 season over the past weekend. The Miami Trace third grade White team lost to Jamestown Blue, 27-0; the Miami Trace fourth grade White team defeated Jamestown Blue, 14-0; the Panthers’ fourth grade Black team lost to Springfield Blue, 31-0. The Miami Trace fifth grade White team fell to Jamestown Blue, 21-0; the fifth grade Black team lost to Wilmington Black, 6-0; the Panthers’ sixth grade White team tied Jamestown Blue, 0-0 and the Miami Trace sixth grade Black team lost to Miamisburg Black, 20-0. 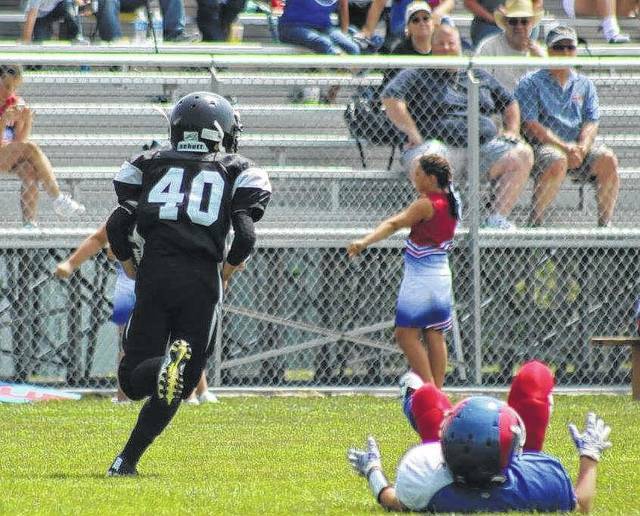 Lucas King (40) of the Miami Trace 4th grade White team running his way to one of his two touchdowns on the day versus Jamestown Blue.